This manual provides a comprehensive description of the AMSTRAD PC1512 hardware and firmware. General information about the PC1512, GEM Desktop and the delivered operating system software is contained in the AMSTRAD PC USER MANUAL. This manual is intended to satisfy the needs of advanced developers who must have access to the various resources available within the PC1512. The CPU is configured to run in maximum mode and the instruction set may be optionally extended by the addition of an 8087-2 Numeric Data Coprocessor. The 8087 BUSY output is connected directly to the 8086 NOT TEST input. The main board memory consists of 512K bytes of system RAM with parity checking and 16K bytes of system ROM without parity checking. Note that all address constants in this document are in hexadecimal form except as noted. The 512K byte user RAM starts at CPU memory address 00000 and extends to 7FFFF. An additional 128K bytes may be added externally in 32K byte blocks in the address space from 80000 to 9FFFF to extend the total system RAM to 640K bytes, provided the 640K byte option is not already installed on-board. The 128K byte address space from A0000 to BFFFF is reserved for the 8-bit memory associated with certain controllers, and is not used by CPU programs. The on-board Alpha/Graphics VDU controller uses the 16K byte address range from B8000 to BBFFF for screen refresh memory. Also an optional external monochrome alphanumeric VDU controller uses the 4K memory address range from B0000 to B0FFF. The 192K byte address space from C0000 to EFFFF is reserved for external expansion ROM address space. The optional Hard Disk controller uses the 20K byte address range from C8000 to CBFFF. The 16K byte system ROM is at FC000 to FFFFF and contains the Resident Operating System (ROS) firmware. The 48K byte address range from F0000 to FBFFF is reserved for ROM space expansion. Note: I/O addresses above 3FF, if accessed, wrap around and are mapped onto the range 000-3FF. Any of the unlisted addresses may be used in the future. I/O Addresses wrap around above 3FF occurs as described on page 10. The AMSTRAD PC supports four DMA channels on the system board, using an 8237-4 DMA controller and programmable page registers to extend its addressing range from 64k bytes to 1M bytes. Each channel is able to transfer data in blocks of up to 64K bytes within a page. The DMA channels are for 8-bit data transfers between (8-bit) I/O devices and 8-bit or 16-bit memory. In peripheral (slave) mode, CPU I/O address lines A0 - A3 are connected conventionally so that 16 command codes appear in the order described in the 8237 data sheets (See section 3.5). The DMA controller CLK is driven at 4MHz (± 0.1%). In master mode during DMA transfers on channels 1,2 and 3, one wait state is added resulting in a five-clock DMA bus cycle of 1.25uS. Channel 0 transfers have a four-clock bus cycle of 1uS. 0 8253 Timer/Counter OUT1 output - for memory refresh. 1 Spare for use by expansion bus. Used by external SDLC Serial Port. 2 765 Floppy Disk Controller DRQ output. Available on the expansion bus. 3 Spare for use by expansion bus. Used by external Hard Disk Controller. DMA channels 1, 2 and 3 can address the entire 1M byte addressing range of the 8086 CPU through the use of their associated DMA page registers. There are three DMA registers, one each for channels 1 through 3. Each page register defines for its channel which one of sixteen 64K byte pages in the 1M byte address range DMA transfers are to occur. The page registers are static so that modulo 64K byte addressing occurs at page boundaries. They are located in the I/O address space in the range 081-083. After power-up or system reset the DMA page registers are undefined and are initialised to zero by the ROS firmware and all 8237 internal locations for channels 1-3 are initialised to a state comparable to the channel zero initialisation above. Following industry compatibility, memory to memory DMA is not supported on the PC1512. It is prohibited due to timing considerations. Nine levels of hardware interrupt are provided for in the system by the CPU Non Maskable Interrupt (NMI) and by an 8259A-2 Interrupt Controller. All levels including NMI, are maskable under software control. CPU I/O address line A0 is connected conventionally so that the command codes appear in the order described in the 8259 data sheets. The SP/EN pin is tied high signifying that the device is to be hardware un-buffered and designated as a master, not a slave. NMI Memory Parity Error and 8087 NDP INT output. 0 8253 Timer/Counter Out0 output. 1 Keyboard Scan Code Receiver. 2 146818 Real Time Clock IRQ output. 3 Spare for use by expansion bus. Used by external (secondary) Asynchronous Serial Port and external SDLC Serial Port. 4 8250 UART INTRPT output. Used by external SDLC Serial Port. 5 Spare for use by expansion bus. Used by external Hard Disk Controller. 6 765 Floppy Disk Controller INT output. Available on the expansion bus. Used by external Printer Port (secondary) Printer Port (tertiary), external Monochrome VDU Controller, and external cluster controllers. Fixed priority - level 0 highest, level 7 lowest. Following a reset NMI is disabled. NMI can be connected to the 8087 NDP, the on-board memory parity check circuit, and the expansion bus I/OCHCK (I/O Channel Check). 1 Used by DMA channel 0 (for dynamic ram refresh). 2 Tone Generation for Speaker. GATE 2 Controlled via Port B (System Control Channel) Speaker Modulate output. OUT 0 Interrupts on 8259 PIC IR0 input. OUT 1 Requests on 8237 DMA DREQ0 input. OUT 2 Logical 'AND' with Port B (System Control Channel) Speaker Drive output. Also goes to Port C (System Status-2 Channel) as an input. Following a reset, the system initialisation firmware in the ROS programs the 8253 PIT for counter 1 (dynamic ram refresh) operation as a rate generator producing a signal with a period of 15.13 uS. There are no restrictions requiring the initialisation and programming of counters 0 and 2. Two system status input channels and four output channels are provided on-board. Ports A, B and C emulate a pre-programmed 8255 PPI device. They are located in the I/O address space in the range 060 - 06F. Port B is programmed for control output, Port A is programmed either for Status-1 input or for receiving data from the keyboard, and Port C is programmed for Status-2 input. Port C(U) = input. 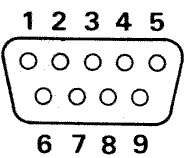 Port C(L) = input. Unlike an 8255, power-up and reset do not affect this configuration. 7 Enable Status-1/Disable Keyboard Code on Port A. 6 Enable incoming Keyboard Clock. 5 Prevent external parity errors from causing NMI. 4 Disable parity checking of on-board system Ram. 0 8253 GATE 2 (Speaker Modulate). When bit 7 is set high (1), Status-1 data is enabled on Port A, the keyboard data path and keyboard interrupts are disabled. When bit 7 is set low (0), keyboard input data is enabled on port A, the keyboard data path and keyboard interrupts are enabled. The keyboard interface operates as follows: Each incoming keycode is latched on-board, causing a keyboard interrupt (on level 1). While the interrupt remains pending, the incoming keyboard data signal is forced low as an acknowledgement to the keyboard that the keycode has been received. As soon as the interrupt has been cleared, the keyboard may use the Data signal to transmit the next keycode. PB1 may be toggled to drive the speaker with a corresponding pulse train. The speaker may also be driven by a wave form from the 8253 PIT OUT2 output (simultaneously with PB1, if required). PB0 may be toggled to drive the 8253 gate input, hence modulate counter 2 operations and therefore the speaker with a corresponding waveform. Thus there are three different methods of driving the speaker which may all be performed simultaneously to create various audio effects. Colour, alpha, 40 X 25 chars, bright white on black. Colour, alpha, 80 X 25 chars, bright white on black. External Monochrome controller, 80 X 25 chars. Following a reset, the hardware selects VDU mode 2. The ROS then sets the initial VDU state based on the DDM value. 7 On-board system RAM parity error. 6 External parity error (I/OCHCK from expansion bus). 5 8253 PIT OUT2 output. PC7 is forced to the zero state when on-board system RAM parity checking is disabled by PB4. When the I/OCHCK condition (external parity error) from the expansion bus is disabled from causing NMI (by PB5 set high), PC6 reflects the state of the I/OCHCK input else it reflects the latched state of I/OCHCK. 0 1 1 1 0 512K bytes on-board. 0 1 1 1 1 544K bytes (32K external). 1 0 0 0 0 576K bytes (64K external). 1 0 0 0 1 608K bytes (96K external). 1 0 0 1 0 640K bytes (128K external or fitted on-board). 6 PA6 - Second Floppy disk drive installed. 1 PA1 - 8087 NDP installed. 7 PC2 (MSB) - Undefined. 6 PC1 (MSB) - Undefined. 5 PC0 (MSB) - Undefined. 4 PC3 (MSB) - RAM4. 3 PC3 (LSB) - RAM3. 2 PC2 (LSB) - RAM2. 1 PC1 (LSB) - RAM1. 0 PC0 (LSB) - RAM0. Any write access to I/O Address 066 regardless of the value written will cause the hardware to generate an immediate 512uS system reset and pulse the reset line on the expansion bus. The contents of the on-board system RAM is preserved following a system reset. HD146818 Real Time Clock plus RAM device is installed and backed up by a set of four non-rechargable size AA batteries. The clock device provides a time of day clock with alarm, a one hundred year calendar, a programmable periodic interrupt, and 50 bytes of static RAM. The static RAM is called the Non-Volatile RAM (NVR) and used to store system configuration data such as number of disk drives, memory size, serial I/O parameters, and default VDU screen mode. The ROS firmware maintains a checksum of the NVR and will reset the configuration data to "sensible values" during startup whenever the checksum value is incorrect (thus destroying your actual configuration). Even though direct hardware access to the NVR is possible it is recommended that the programs make use of the ROS Enhanced Function Interrupt (Interrupt 21) to access the NVR because these properly maintain the NVR checksum value. When system power is off and the 146818 is on battery backup power, the functions which remain active are the clock and the retention of RAM data. No battery power is used while the system power is on. The input crystal oscillator runs at 32.768 KHz. The 146818 interrupt request is connected to the 8259 system interrupt controller on level 2 (which is also available on the expansion bus). The 146818 power-sense input PS is connected to a battery condition sensor. When the backup battery voltage is sufficiently low, the VRT bit in register D becomes set indicating that the time, the calendar and the NVR data are no longer valid. When this condition is noted during startup, the firmware outputs the message "Please fit new batteries" and resets the NVR to default values (See section 2.4). All the features described in the 146818 data sheet are available with the exceptions that the CKOUT (clock output) and SQW (square wave output) pins are not connected on the main board. Writing or reading the NVR involves a two step sequence for each byte that is accessed. The RTC Address channel (I/O Address 070) is first loaded with the NVR location to be accessed. Then the RTC Data channel (I/O Address 071) is either written or read to complete the I/O operation. This facility should be used with caution in order to avoid disturbing the system configuration data. The printer port provides an interface for driving 8-bit and 7-bit Centronics compatible printers. The timing of the signals to the printer is under direct software control. There is a read/write control latch for sending control signals to the printer, an unlatched read-only printer status channel, and a read/write data latch for sending printer data. The contents of the data latch are undefined following a power-up or system reset. When Interrupt on ACK is enabled an incoming Printer Acknowledge condition will cause a system interrupt on level 7 (which is also available on the expansion bus). If the printer control lines normally driven via latched bits D0 - D3 are driven externally, the data read on input to this channel will be the logical OR of the latched bits and the externally driven bits, e.g. If a data bit is false and the corresponding cable bit is driven true by the external driver, the bit input will be true. Following power-up or system reset, the control latch contents assume reset conditions as shown. Note that this is a general purpose printer interface and that not all printers require all the control signals, hence the provision for non-standard printers to be able to drive some of the control signals as inputs to the main board. The timing requirements on Centronics compatible printers generally specify that data must be present at 1uS before the strobe is made active, and must remain valid for at least 1uS after strobe goes inactive. The strobe duration must be between 1uS and 500 uS. Printer Busy status can be inspected as soon as the strobe is inactive in order to determine when more data can be sent. LK1 - LK3 are general purpose factory installed option links on the main board which are used by the firmware to distinguish different machine configurations. The first seven states (0 - 6) are used for language variants and the all ones (7) state is used for Power-Up Self Test Maintenance Mode (See section section 2.2). Note that this is a general purpose printer interface and that not all printers implement all the status lines, nor do they all attach the same meanings to the error conditions. Printer Busy normally indicates that a printer cannot receive data, for example during data entry, printing, when offline, or during a printer error condition. Printer Acknowledge, if implemented is generally asserted by a printer to indicate that data has been received and the printer is ready to receive the next data. Note that Printer Acknowledge (ACK) can also be set to cause interrupts (See 1.10.2). 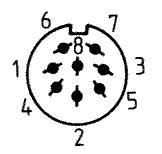 Section 1.14 contains the printer connector pin assignments. The VDU controller is implemented as a partially emulated MC6845 CRTC and provides either a colour alphanumeric display (Alpha) or a colour pixel display (Graphics). The frame rate is 60 Hz non-interlaced and 200 scan lines are displayed between the top and the bottom borders. The highest resolution on a scan line between the left and the right borders is 640 pixels displayed. The 16K Byte VDU screen memory area (from B8000 to BBFFF) is overlaid (in Graphics modes) in four planes giving a resultant 64K bytes of display RAM and enabling sixteen colours to be available. The "Light" colours imply higher intensity video. On the monochrome monitor the R,G,B and I signals are summed and weighted 2, 4, 1 and 8 respectively to form the 16 level grey scale luminance column in the table. Two Alpha modes are available: either (medium resolution) 40 characters by 25 rows or (high resolution) 80 characters by 25 rows. The modes require 2000 bytes or 4000 bytes of display RAM respectively. A low resolution 160 by 100 pixels 16 colour graphics mode may be obtained in high resolution Alpha mode by programming the CRTC for two scan lines per character, and by using certain half-block characters in the character set as pixels. This mode requires 16000 bytes of display RAM. The character set is formed by a ROM character generator and each of the 256 characters is made up of a 8 by 8 pixel matrix. Each character displayed takes up two bytes of display RAM consisting of a character code byte and an associated attribute byte. The attribute byte allows a choice of either 16 foreground and 8 background colours per character, plus blinking, or a choice of 16 colours for both foreground and background without blinking. The display border may be any one of 16 colours. The display starting address in the display RAM is programmed via the CRTC. The starting address must be on an even address boundary and it addresses the first (leftmost) character position in the top row of the display. In each pair of display RAM bytes, the even address is for the character code and the odd address is for the attribute byte. Subsequent characters are displayed along the row from left to right. When the end of a row is reached the next pair in the display RAM appears in the first character position of the next row down. There are two Graphics modes available, either Mode 1 (medium resolution) 320 pixels per scan line with a choice of four colours per pixel or Mode 2 (high resolution) 640 pixels per scan line with a choice of sixteen colours per pixel. The modes require 16000 and 64000 bytes of display RAM respectively. The display RAM is divided into four 16K byte planes, one each for all the Red, Green, Blue and Intensity bits. Each plane may be individually written or read by the CPU, and two or more planes may be selected by the CPU for writing simultaneously with the same data. The colour planes are not used in Mode 1, since only 16K bytes of display RAM (i.e. one plane) is ever required. For this reason system reset or entry into any other display mode other than graphics mode 2 forces selection of all planes for simultaneous writing by the CPU, which appears (to the software) as though only one 16K byte display RAM is installed in the address range from B8000 to BBFFF. In Mode 2 the four memory planes become active and the colour of each pixel is controlled by the setting of the VDU Colour Plane Write Register at the time a pixel is written. The display memory for one scan line consists of 80 bytes, each containing 8 pixels. Since there are four planes, each displayed pixel is actually made up from 4 bits of information (R,G,B,I) specifying one of 16 colours. The border is programmable to any one of the 16 colours. The ROS emulates two colour 640 by 200 graphics mode (software mode 6) by writing to all four colour planes (Intense White). Then the VDU Colour Plane Select register is used as the foreground palette selector. See section 2.3.7. The address mapping of the scan lines in display RAM for mode 2 is identical to that depicted for display Mode 1 - all even scan lines (from B8000 to B9F3F) followed by all odd scan lines (from BA000 to BBF3F). The major difference is that data written to one location may actually be stored in up to four planes simultaneously. Note that even though the same physical address range is used between graphics and text modes, the internal data storage within VDU RAM changes between the different modes. This means that data patterns stored in successive locations in text modes will be found in the IRGB planes when graphics mode 2 is selected. Also data patterns stored in graphics mode 1 will be found on all planes when graphics mode 2 is selected. It is therefore not generally an acceptable practice to store information in one VDU mode and then switch to another mode else unexpected results may be encountered. There are five programmable registers for VDU mode and colour selection. These consist of the VDU Mode Control Register, the VDU Colour Select Register, the VDU Colour Plane Write Register, the VDU Colour Plane Read Register, and the VDU Graphics Mode 2 Border Register. On power-up or following a system reset, the control registers are preset as described below. The VDU Mode Control Register is a write only register located at I/O address 3D8. It is used to control the state of the VDU circuitry, selecting Alpha or Graphics mode and the various sub options available within Alpha and Graphics modes. When bit 5 is set in Alpha modes, the foreground of all displayed characters with attribute bit 7 (AT7) set will blink at 1.875 Hz (1/32 frame rate) in synchronism with frame flyback. Bit 5 has no effect in Graphics modes. Bit 4 (Select Graphics Mode 2) has no effect in Alpha modes. The Select Palette 2 bit (bit 2) has no effect in Alpha modes or in Graphics mode 2. It is used in conjunction with bit 5 of the VDU colour select register to control graphics mode 1 palette. To select palette 2, bit 5 of the VDU colour select register must be reset and bit 2 of the VDU mode control register must be set. Bit 0 (Select Alpha 80 Char mode) has no effect in Graphics modes. To avoid unsightly effects on the screen, this register should be updated during frame flyback time. Any kind of mode changing should preferably be done with video disabled. Mode changing involves the use of bits 1 and 0 and usually some re-programming of the CRTC. On power-up and following a system reset, all bits of this register are cleared to zero. When using the full 16 colour capability in Graphics mode 2, programmers must set the VDU Colour select register to 0Fh and vary the plane selection with the Colour Plane Write register. To avoid unsightly effects on the screen this register should only be updated during frame flyback time. On power-up or following a system reset, all bits in this register are cleared. The VDU Colour Plane Write Register is a write only register located at I/O address 3DD. It is used in Graphics Mode 2 for controlling which colour plane or combination of colour planes will be written to when addressing the display RAM (B8000 to BBFFF hex). The CPU simultaneously writes the memory planes that are enabled for writing. Writing to this register has no effect except in Graphics Mode 2. Following the selection of Graphics Mode 2, (other than when already in Graphics Mode 2) bits 0 through 3 are set to one, but may subsequently changed by writing to this channel. On power-up or following a system reset or selection of any other mode other than Graphics Mode 2 the register is cleared and fixed so that the CPU will only read from the Blue Plane. The VDU Graphics Mode 2 Border Register is a write only register located at I/O address 3DF. It is used in Graphics Mode 2 for specifying the border colour. Bits 0 through 3 specify one of sixteen colours. On power-up or following a system reset, or following selection of Graphics Mode 2 (other than when already in Graphics Mode 2) the register is cleared (Graphics Mode 2 border black). Frame flyback time starts at the same time as the bottom border and lasts for 46 horizontal scan periods, ending 16 scans before the end of the subsequent top border. Bit 2 reflects the state of the light-pen push button switch, which is neither latched nor debounced. Bit 1 when set (1) indicates that the light pen latch is set, triggered either by a pulse from the light pen or by writing data to the light pen channel. Writing any data to the Clear Light Pen channel clears the latch, which is undefined following power-up and unaffected by system reset. When the VDU Status Register is read, bit 0 toggles to the opposite state. Bit 0 is cleared (0) following power-up or following system reset. The VDU controller is a partial emulation of a MC6845 CRT Controller device. Some of the registers which are programmable in an actual MC6845 are not programmable in the AMSTRAD PC1512. These differences are noted in the table which follows. The remaining registers must be programmed according to the VDU mode of operation required in conjunction with the VDU Mode and Colour Select Registers previously described. A mode changing operation should be performed in the following sequence: Disable video, reprogram the CRTC as required, reprogram the Mode and Colour select registers as required, (maintaining video disabled), initialise display RAM as required, enable video. The CRTC is controlled by way of two I/O addresses, the CRTC Address register and the CRTC Data I/O location. The CRTC Address register is a write only register located at I/O address 3D0 (and all even addresses to 3D6). The address register is a 5 bit register used to select one of eighteen internal control registers (R0 - R17). Addresses greater than 17 produce no results. Once the CRTC Address register has been loaded, the CRTC Data I/O location which is located at I/O 3D1 (and all odd addresses to 3D7) allows access to the selected internal CRTC register. Depending on the particular register selected the location may be either Read/Write (RW), Read Only (RO) or Write Only (WO). Note that all values above are in decimal format. Registers marked '*' are not software programmable in the emulated MC6845 CRTC implementation, unlike a real MC6845. They are fixed in hardware according to the VDU mode currently selected. The two sets of registers marked by '[ ]' should normally be programmed nonzero. The magnitude of the non-zero value will have no effect on the display, but a zero value in either register will cause the whole screen to display the border colour. The cursor function of a 6845 CRTC is supported only in Alpha modes. The cursor blinking function is performed by a circuit external to the CRTC and blinks the cursor at 3.75Hz (1/16 frame rate) in synchronism with frame flyback. The cursor non-display feature, variable blink rate feature and variable blink period feature of the 6845 CRTC are not supported. The valid range of values for Cursor Start Raster (R10) is from 0 to 30 (decimal) and the value of 31 (which will turn the cursor off). Values greater than 31 are not recommended. Graphics, LPEN value = M + 1 or M + 2. Alpha 80, LPEN value = M + 3 or M + 4. Alpha 40, LPEN value = M + 1 or M + 2. In Alpha modes, the CRTC register values for start address and light pen position are in the 8K range 0000h to 1FFFFh, and wraparound occurs above this range. The register value corresponding to a character position in display RAM must be derived from the even byte address in the 16K range B8000h to BBFFFh by subtracting B8000h and halving. In Graphics modes, the CRTC register values for start address and light pen position are in the 4K range 000h to FFFh, and wraparound occurs above this range. A register value corresponds to two pairs of pixel bytes in display RAM on word boundaries, one pair displayed on an even scan and the other pair displayed on the following odd scan in the same horizontal position. The register corresponding to the pixel byte pair position in display RAM must be derived from the even byte address in the 8K range B8000h to B9FFFh (for an even scan) by subtracting the address offset B8000h and halving. Similarly for the odd scan line the offset BA000h is subtracted from an even byte address in the range BA000h to BBFFFh and halved. There are important differences in the way the VDU Controller maps and uses the display RAM for different VDU display modes. The Alpha Mode to Graphics Mode memory mapping follows the scheme depicted in fig 1.3. The concept of planes does not exist in character modes and character data is stored sequentially in display RAM. In Graphics modes, the display RAM is viewed logically as colour planes which are grouped in four byte groups. This means that there is an effective "gear change" between alpha and graphics modes and storing in an address such as B8000h in graphics modes spans the address range from B8000 to B8003 in alpha modes. 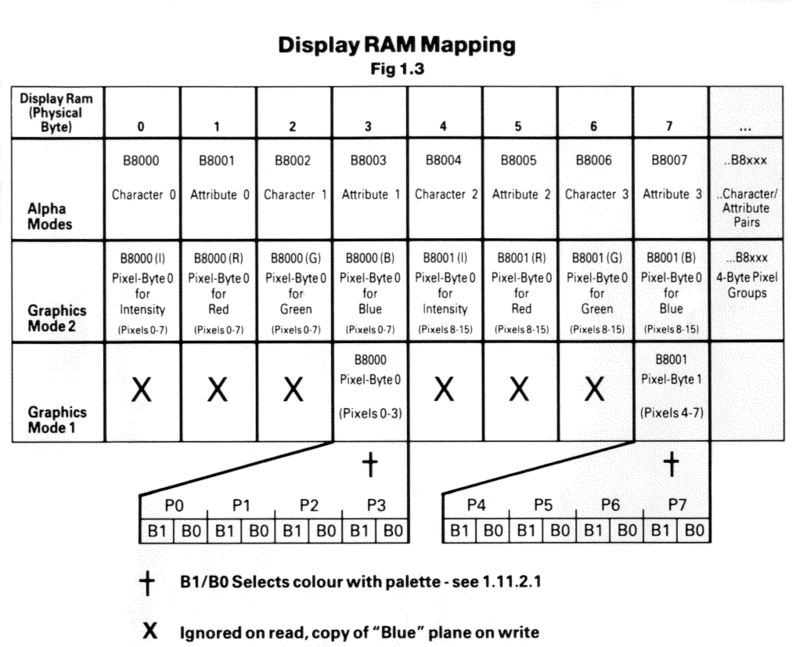 In Graphics Mode 1, the display RAM mapping is the same as for Graphics Mode 2, but only the data contained on the Blue plane is used to form pixels on the screen. When the CPU writes to display RAM in Graphics Mode 1, the same data is stored in all planes. It is very important to note that it is impossible to store character and attribute pairs in consecutive display RAM in graphics mode. Attempting to clear the text screen with text data while in graphics mode and then switching to an alpha display mode will produce a "Stars and Bars" effect on the screen. The VDU display timing and system CPU/DMA timing are derived from different, unrelated reference frequencies. For this reason CPU accesses to the display RAM must be synchronised to the display timing by the VDU controller, and this is done by inserting CPU wait states as appropriate. Whenever the CPU accesses the display RAM, the total number of 125nS wait states incurred, including those already added automatically by the 8bit bus conversion process, will range from a minimum of 12 to a maximum of 46. At most, a situation in which 46 wait states are necessary could occur once every 63.7uS, in all modes. Similarly, the need for 38 wait states could occur at most every 63.7uS in Graphics mode 2 or in 80 x 25 Alpha mode. The 8K character generator ROM can contain a maximum of four different character sets, each in a different 2K byte quadrant of the ROM. Only one character set can be used at a time and it is selected by means of two option links, LK6 and LK7, located on the right hand side main board. Out Out ROM Fourth Quadrant - Default factory setting. In Out ROM Third Quadrant - (optional Danish). Out In ROM Second Quadrant - (optional Danish). In In ROM First Quadrant - (optional Greek - late models). The floppy disk controller is based on the NEC uPD765A single chip controller, and supports one or two 5.25 inch single or double sided, MFM double density floppy disk drives with a data rate of 250 kilobits per second. The Drive Select bits (DS1, DS0) are only valid for values of 00 and 01 for drives 0 and 1 respectively. The drive selection qualification is only completed when either bit 4 (for drive 0) or bit 5 (for drive 1) is set. In addition setting bits 4 or 5 will have no effect until the value of DS1, DS0 is correspondingly set. Bit 2 when cleared (0) holds the 765A reset until bit 2 is again set (1). Note that a reset must last for at least 3.5 uS. On power-up or following a system reset, all bits in this register are cleared to zero. The clock frequency of the 765A FDC is fixed at 4.0 MHz. Disk data transfers are done by DMA using the on-board DMA controller. The 765A DRQ output may connected to or disconnected from the DMA controller DRQ2 input by software using Drive Selection Register bit 3. An interrupt level is available for use by the 765A to signal command completion and attention status to the CPU. The 765A INT output may be connected to or disconnected from the interrupt controller IRQ6 input by software using Drive Selection Register bit 3. Drive 0 is always present. Drive 1 is optional. Drives 2 and 3 are not implemented and can never be accessed. Drive Ready output signal from the currently selected drive is connected to the 765A RDY input. For drives which do not a drive ready output the 765A RDY input may be optionally fixed to the true condition. The 765A Drive Select outputs US1 and US0 are not used to select the drives. This function together with motor control is done via the Drive Selection Register which is external to the FDC 765A. The FLT (Fault) input 765A is forced permanently false. A Two-Sided status signal from the drive(s) is not provided but interface to the drives allows the use of double sided drives. Write precompensation of 250 nS is provided. The 765A may be individually reset by software using Drive Selection Register bit 2. The asynchronous serial port is based on the National INS8250 ACE (or UART), single channel device. The clock frequency input of the 8250 is 1.8432 MHz (± 0.1%). The 8250 BAUD OUT output is connected to the RCLK input. An interrupt level is available for use by the 8250. When the 8250 OUT2 output is driven low (i.e. a 1 is written to bit 2 of the 8250 MODEM Control Register) then the INTRPT signal is connected to the interrupt control IRQ4 input. The serial interface uses a 25-way subminiature D type plug (male) connector emulating a DTE (Data Terminal Equipment). The electrical levels of signal lines on this interface conform with EIA (Electronics Industry Association) standard RS-232C (and the equivalent V.24 interface standard). The RS232C drivers and receivers between the 8250 and the serial channel connector are all inverting. * These interchange circuits, where implemented, shall be used to detect either a power off condition in the equipment across the interface, or the disconnection of the interconnecting cable. The terminator for these circuits shall interpret the power off condition or the disconnection of the interconnecting cable as an OFF condition. See Appendix 3 for additional details of serial signals and cable connections. The parallel printer port is described in Section 1.10 and is a general purpose 'centronics' style 8-bit interface. 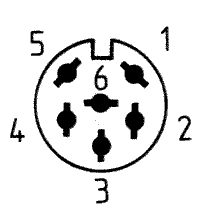 The printer interface uses a 25-way subminiature 'D' socket (female) connector located at the back of the PC1512. Appendix 4 contains the Amstrad PL-2 printer lead specification for the DMP3000 printer. Keyboard data input to the CPU is via the 8255 PPI Port A, and the keyboard interrupt (level 1) of the 8259A PIC. Both of these have been previously described in sections 1.6 and 1.8. The Serial Clock and Serial Data signals are used for keyboard interface. These two bidirectional signals are used by the keyboard microcontroller to send keycodes to the main electronics board. The main electronics board also uses the same two signals to indicate readiness to receive another keycode back to the microcontroller. In addition these two signals are used to reset the microcontroller under hardware or software control. The quiescent state for both Serial Clock and Serial Data is high. A minimum of 5 uS must separate a transition of one signal from another transition of the same signal, or any transition of the other signal. Keycodes are sent from the keyboard microcontroller to the main board in 8-bit serial form MS bit first. Keycode data received by the main board is clocked into a shift register as either a "1" bit sequence or as a "0" bit sequence. To be interpreted as a "1" bit, the Serial Data signal must remain high during the time period when Serial Clock goes low and returns to the high state. To be interpreted as a "0" bit, Serial Data must be low prior to the Serial Clock transition from high to low, Serial Data will then go high followed by Serial Clock. 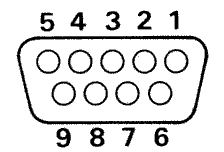 The "1" bit or the "0" bit is clocked into the shift register on the falling edge of Serial Clock. Upon receiving a keystroke from the microcontroller, within 5 uS of the last clock falling edge, the main board electronics drives the Serial Data line low and maintains it low until it is ready to receive a new keystroke. When the main board returns the Serial Data signal to the high state the microcontroller is free to send another keystroke. This response to the reception of a keycode is termed the ACKNOWLEDGE sequence. The mainboard electronics causes a RESET to the keyboard microcontroller by driving the Serial Clock line low for 10 milliseconds or more. The state of the Serial Data signal does not affect the reset sequence. The 8-bit keyboard data is capable of 128 make codes correspondingly 128 break codes. For any key which is pressed, the ( make ) keycode produced is in the range of 0 - 127 decimal. When a key is released, the ( break ) keycode produced is the same as the make keycode except that the top bit is set so that the value is in the range of 128 - 511 (decimal). The keycodes and their corresponding token values are covered in the ROS firmware (Section 2.3.5). After a key is pressed and the keycode has been sent to the main board electronics, if no new keys are pressed and the key has remained pressed for more than one second, then the keyboard microcontroller re-sends the keycode every 83 milliseconds provided that the main board indicates by an Acknowledge sequence that is ready to accept a new keycode. The keycode AA hexadecimal is sent after a reset to indicate successful completion of power-up tests. The M1 and M2 signals are connected directly to the keyboard controller in order to produce keycodes. The mouse interface consists of two switch inputs from push buttons and two 8-bit X & Y coordinate counters. The two mouse switches (M1 & M2) are arranged to form part of the keyboard matrix and are handled as keyboard data (producing low level keycodes 7E and 7D respectively). The Mouse X-Coordinate at I/O Address 078 is an 8-bit counter which can be read by the CPU. Any write access regardless of the value written to the X-Coordinate location clears the counter. Similarly the Mouse Y-Coordinate at I/O Address 07A can be read by the CPU or cleared by any write access to its I/O address. The counters are incremented or decremented according to the direction of movement of the mouse, and their values indicate the mouse movement since last read or cleared. The X-Coordinate counter increments for "Right" motion and decrements for "Left" motion. The Y-Coordinate counter increments for "UP" motion and decrements for "Down" motion. In order to properly track mouse motion, software should read and clear the coordinate counters at a rate high enough to prevent overflow from positive values to negative values or negfative values to positive values for a fairly high rate of mouse movement. The scaling of mouse movement is such that one increment of the counter represents 1/8 mm of physical mouse motion. The delivered operating systems have AMSTRAD specific mouse drivers which actively perform the Read-and-Clear operation (every 18 ms) using the ticker interrupt. This can cause the appearance of no mouse motion to the casual observer sampling the mouse coordinate counters. See Appendix 1 for additional details concerning Mouse Software Interfaces. The mouse connector is a 9 way D type (female) connector located on the left hand side of the case and it has an AMSTRAD specific pinout. Attaching any other manufacturer's hardware (even though the connector may be similar) to the PC1512 mouse connector may cause serious damage to either the main board electronics or to the alternative (mouse) hardware. The first four pins contain optically encoded phase XA, XB, YA and YB square waves. For positive motion the square wave on the A phase leads the B phase by 90 degrees with the reverse being true for negative motion. The remaining pins carry Mouse Button 1 (M1), 5V power, Ground and Mouse Button 2 (M2) signals. The AMSTRAD PC supports an industry standard joystick interface. The joystick inputs are handled as keycodes from the keyboard interface. The low level keycodes are in the range of 7C down to 77 (hexadecimal) corresponding to Up, Down, Left, Right, Fire1 and Fire2 respectively. The ROS firmware (See section 2) translates the directional codes to cursor key tokens and the Fire buttons can be assigned variable tokens depending on the NVR settings. Please note that this is not an analog interface. In order to use an analog joystick an analog card for the expansion slots is required. 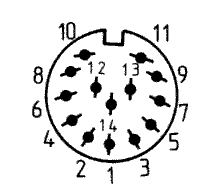 The joystick connector is a 9 way D type (male) connector with an industry standard pinout. Attaching an incorrect device (even though the connector may be similar) to the PC1512 joystick connector may cause serious damage to either the main board electronics or to the incorrect (joystick) hardware. The AMSTRAD PC1512 Supports a standard light pen interface via the emulated MC6845. The Light Pen connector is located by removing the expansion slot cover at the rear of the machine. The connector is located inside the PC case on the right hand edge of the main board just forward of the expansion card connectors. 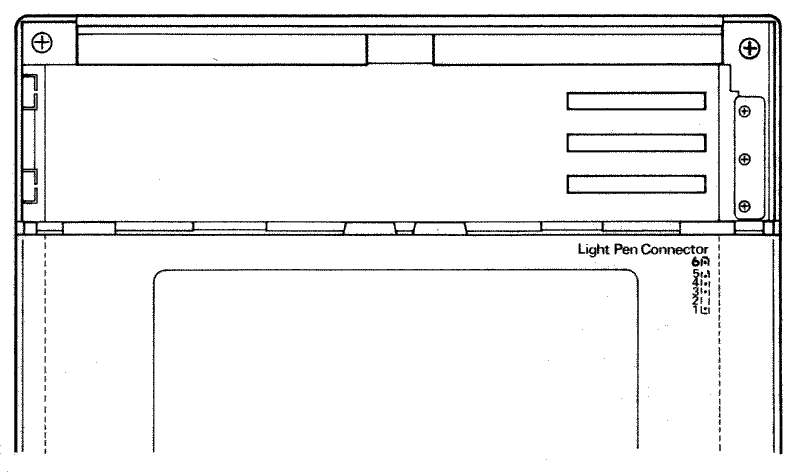 It consists of a 6-way berg strip and is labeled PL8 (LIGHT PEN) in large letters. Pin 1 is the forward most pin viewed from in front of the machine (the disk drive end). The I/O expansion slots are laid out the same as the industry standard 16-bit Personal Computer bus. 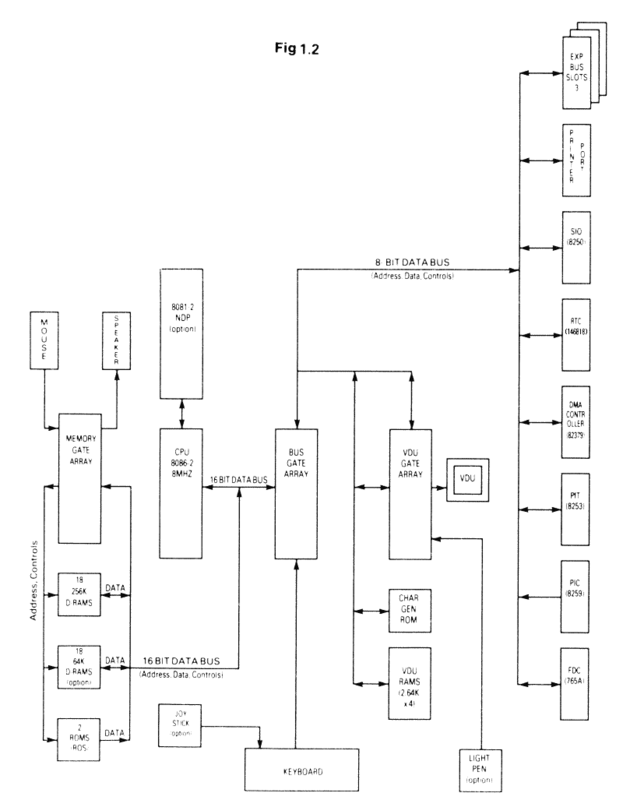 The translation from the internal 16-bit 8086 bus to the 8-bit I/O bus layout is done by main board circuitry. Any 16-bit CPU I/O transfers will be broken down into two 8-bit cycles (with wait states) by this circuitry. All signals are TTL compatible and can support a maximum of two low-power schottky (LSTTL) loads per slot. Power supply loading per slot should be limited to a maximum of 900 milliamperes on the + 5 Volt supply, to 33 milliamperes on the - 5 Volt supply, to 50 milliamperes on the + 12 Volt supply and to 50 milliamperes on the - 12 Volt supply. See Appendix 6. Note that direct access to the on-board 16-bit fast memory bus is not available via the I/O expansion slots. Additional engineering details for prototyping adapter boards should be supplied as part of the documentation for that particular hardware. Note 1: Pins 3 & 5 are connected together to the +5 V bus for a total of 7.00 Amp maximum rating. Note 2: See Appendix 6 for Power consumption data.